Welcome to this weeks Tecky Tuesday, today I will look at how to encourage your readers to start posting and becoming part of your blogs community. Last week I posted 5 Tips on how to increase your traffic, this is a follow on from that in how to get comments as a conversion. One of the major things that I wanted from my blog when I started out was to get people to comment on the posts that I write. I must admit it really helps seeing people interact with the posts that you create. It is a great encouragement to push through when you are having a tough time posting on your blog or thinking is blogging worth it. One of the major issues is that on average about 1 out of about 100 people have time to interact with a post. How do you manage to turn a reader into one that shares their opinion? 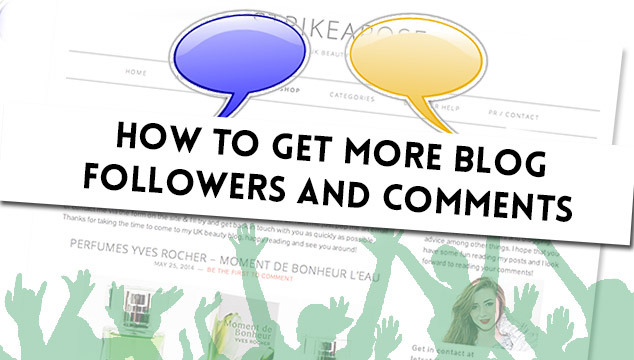 Below are my 5 top tips for increasing comments and building a blogging community. When you write a post, ask something from your readers. Your readers are a lot more likely to share their opinion on a post that has asked them something. If your post is fully rounded, and doesn’t leave them room to get involved they won’t be able to post. I’ve learnt and discovered from the comments left on my posts. If you do have readers that have taken time to write on your blog, start by writing back to them. It shows them that their views are worthwhile. You can get a discussion going and will bring them back to your site if you answer your readers questions. This is a bit of a strange one, write a controversial post. I see many bloggers do this and it can spark quite a lot of attention to your blog, The downside of this is that you might open yourself up for some anger and hate. But as they say, any publicity is good publicity. I’ve written both positive and negative product reviews, which have been talking points on my blog. Being honest about an item, even if gifted, is important. Readers interact more with an honest review as it is more relatable and reliable, they can then share their own experiences, opinions and their own reviews. It is important to encourage people to come to your site even if it is just to disagree with you. I wouldn’t do it regularly, but it can help a little! When you write a post think about what your end goal of that post is. If you can get others to interact with your post they will likely keep coming back in the future to interact with yourself and your blog posts. You will also get more interesting responses that you can respond too, rather than a blogger just leaving a link to their own blog. I think it is important to make it as easy as possible to comment. I use to get a lot fewer comments prior to switching my comment system. I moved over to using Disqus. It makes it possible for people who do not to have an account to comment. It also allows you to set up an account and start talking on loads of different blogs just using your Twitter or Facebook as a login. I would recommend anyone to try it out. If you want I will show you how to set it up on WordPress and on Blogger. I would love to know what you do on your blog to encourage people to post regularly and build up discussions. What are your tips on how to get more blog followers. If you have found this post of use please like it and share it on social media. Remember to check out my previously Tecky Tuesday posts for some blogging tips.